California played an important role in the growth of the National Ski Patrol System. In the winter of 1936, the Auburn Ski Club instituted the first ski patrol unit in California after a skier froze to death on Mt. Lincoln above Donner Pass. The patrol was formed as an embryo organization within the Auburn Volunteer Fire Department. The five members of the patrol Harry Rosenberry, Roy Sands, Al Bequette, Herb Clegg, Jr., and George Gianni completed advanced first aid and instructor courses at their own expense in Sacramento. The City of Auburn purchased a resuscitator and other aid equipment for the patrol. They helped fallen or lost skiers and checked trails for people and obstacles. Other promenint clubs with patrols were Yosemite Winter Club and the Sierra Club in the Donner Summit area. In 1938, the NSA formed the National Ski Patrol System [NSPS] and the Auburn Ski Club became affiliated with the organization. Dr. Don Tresidder, Yosemite, formed the California Division in 1938. Far West patrols developed a rescue toboggan equipped with first aid supplies that was later adopted by NSPS and other ski associations throughout the US. Don Tresidder of Yosemite was the first Far West patroller inducted into NSPS and was assigned number 14 in 1938. 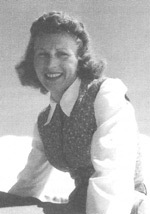 In 1941, Dorothy McClung Wullich of San Diego Ski Club was named the first woman ski patroller and assigned the number one.